SIDNEY — Sidney Police Capt. 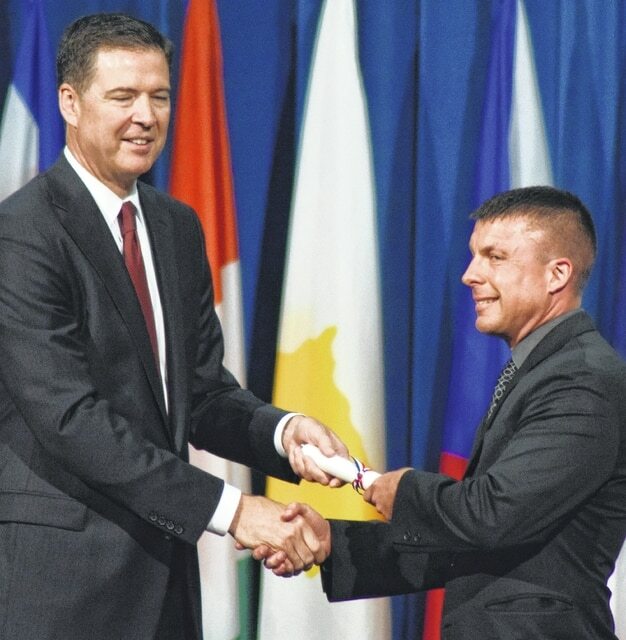 Bill Shoemaker graduated from the FBI’s National Academy Program at Quantico, Virginia, on June 12, Police Chief Will Balling said. The 260th session of the National Academy included participants from 47 states, 27 international countries, and four military organizations. Participants in the FBI’s National Academy Program must be invited to attend. Less than 1 percent of law enforcement executives are chosen to participate. Internationally known for its academic excellence, the National Academy Program offers 10 weeks of advanced investigative, management and fitness training for selected officers having proven records as professionals within their agencies, Balling said. Training is provided by FBI Academy instructional staff, special agents and other staff members holding advanced degrees, many of whom are recognized internationally in their fields of expertise. Classes are accredited through the University of Virginia and students are able to earn undergraduate and graduate credits for the classes. Along with the educational components of the academy, there are physical requirements that Shoemaker completed. He received a “Yellow Brick” and a “Blue Brick” of distinction while at the academy. The “Yellow Brick” was earned by completing a 6.1-mile run through a hilly, wooded trail built by the Marines. Along the way, the participants must climb over walls, run through creeks, jump through simulated windows, scale rocks faces with ropes, crawl under barbed wire in muddy water, maneuver across a cargo net, and more obstacles. The “Blue Brick” was earned by swimming more than 34 miles in the FBI pool. The pool was a 50-meter pool, so that consisted of 1,088 laps over the course of the 10-week program. Shoemaker has been with the Sidney Police Department 18 years. He is currently in charge of the Patrol Section and assists with many other aspects within the department. He has a bachelor’s degree in criminal justice from Bluffton University. He is assigned or has been assigned as an evidence technician, bike officer, tactical response team member, detective, and a fitness instructor.